Nature’s calendar is the best checklist for our alimentary intentions and produce is of better quality and tastier when eaten in season. So here is a list of fruits, vegetables and nuts that are in season in February in the northern hemisphere, and commonly gracing the stalls of farmer’s markets in Italy. They’re here! Carciofi Romaneschi season has officially started, and we couldn’t be happier. The sensational “Mammole” will bloom in April-May but in the meantime we’re ready to cook our artichokes in every which way: deep-fried in the traditionally Jewish-style alla giudia; battered and fried; sautéed with pasta or in a Roman lamb coratella d’abbacchio but also simply raw, dipped in olive oil and lemon. In season from August to April, beets lend themselves to a variety of both sweet and savory preparations. The flavor is rich and sweet when cooked, while slightsly acidic when eaten raw. Their feathery fronds sauteed with olive olive and garlic are equally delicious. In olden days the root of this Belgian chickory was toasted and added to coffee! Today we enjoy its tightly packed white, crunchy and juicy leaves in salad or baked and grilled. 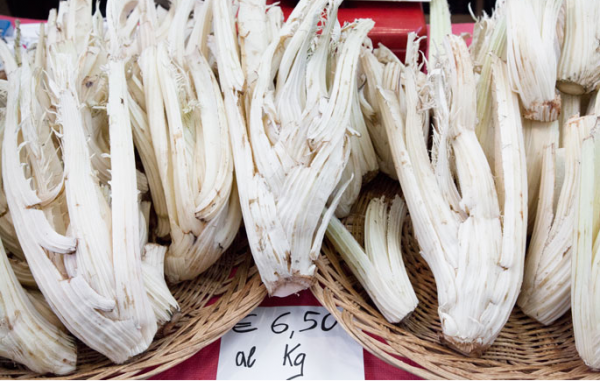 Belgian endive is in season in Italy between November and May. For the salad add some gorganzola cheese, walnuts and a good vinagrette and you’re set. Cardoons once graced the tables of ancient Rome, feeding generations through the centuries and remain a winter mainstay in Italian markets. Cardoons look like celery on steroids with velvety, wide leaves and dusty pale green/off-white stalks. 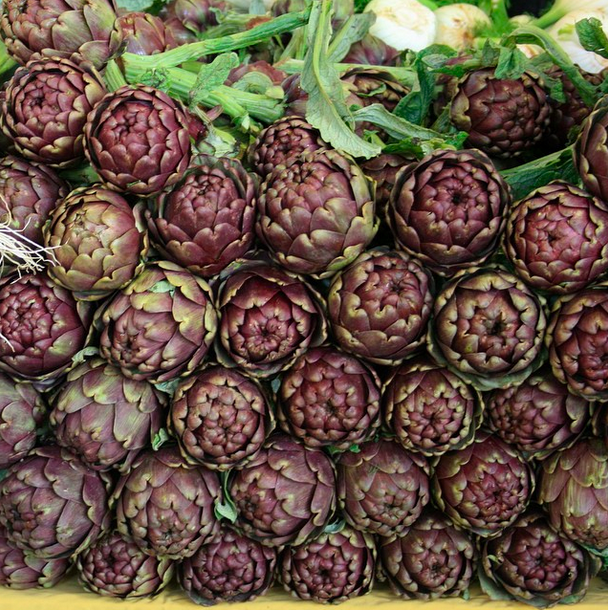 The flavor is delicate and reminiscent of an artichoke and can be employed in many ways in the kitchen: battered and fried; roasting the fried chunks with slabs of Fontina cheese; added to soups; used in a tasty risotto or dipped in bagna càuda. The heavy heads of tightly packed leaves of the waxy “cavolo” cabbage, which can be either pale green, white, burgundy red, or the wrinkled “verza” Savoy cabbage are a perfect addition to the Italian winter menu. Chopped and thrown into minestrone, sautéed with onion and spices, or simply boiled, these cruciferous greens are delightful and contain heaps of Vitamin C, Potassium, Calcium and fiber. Celery Root is easily spotted on the market stall: a cross between a tuber and a root, it’s knobby with a rhino-tough skin. The surprise is that it has a subtle, celery-like flavor with nutty overtones. 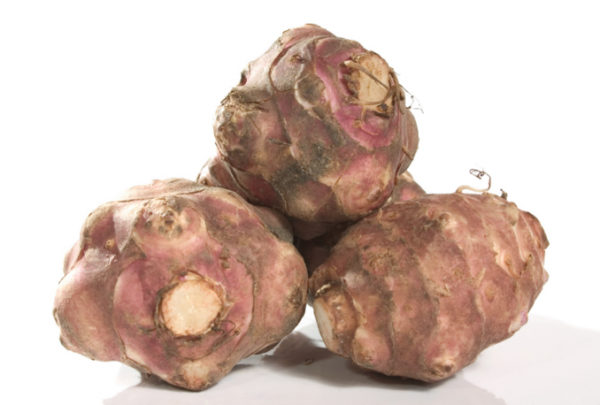 Celery Root is available year round but is at its best from September to April. At its best from November to March, this vegetable is not truly an artichoke but a lumpy, brown-skinned tuber that often resembles a ginger root. Contrary to what the name implies, this vegetable has nothing to do with Jerusalem. The white flesh of Topinambur is nutty, sweet and crunchy and is a good source of iron. The Piedmontese peel it, cut it in chunks and brown it in butter or dip it in bagna càuda. 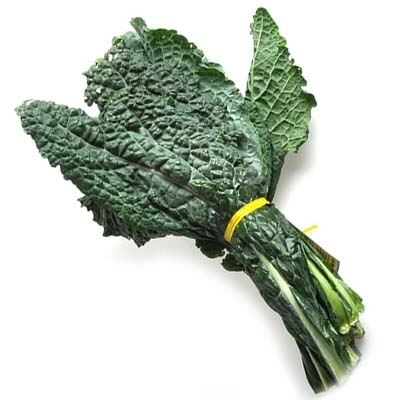 Cavolo nero is also known as lancinato kale, Tuscan kale, black kale or dinosaur kale. This popular loose-leafed cabbage from Tuscany boasts crinkly dark green, almost black leaves, with pleasantly tangy, bitter flavor and a incredibly sweet aftertaste. Although Italians are still quite skeptical about drinking its extracted juice, cavolo nero is historically used as a winter ingredient in many classic Italian soups like Zuppa di Magro and is essential for Ribollita. Although more closely related to garlic, leeks taste more like a mild onion but with a hint of sweetness. 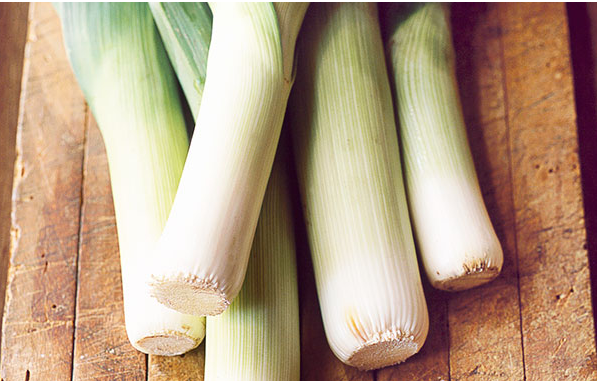 Available all year round, but at their best from September to March, leeks are very versatile and work well used in various recipes or cooked by itself as a side dish. Lettuce is available all year round in a vast number of varieties, either crisp or floppy. Mainly eaten raw in salads, Italians also add lettuce to soups or braise them as a side dish. Among the most commonly available lettuces in Italy during winter are curly endive (Frisée), Escarole endive, and Catalogna endive, which in Rome is called puntarelle. Many varieties of cipolle are in season year round. In ancient Egypt onions were so popular that they would be offered to the gods. Onions were also used as tonic for the slaves who built the pyramids. Because of the onion’s high essential oil content, which lends the characteristic flavor, during the Middle Ages onions were largely used as a natural remedy. There are many varieties of edible onions that differ in color, shape, size and flavor. The shape depends on the variety but also on the growing conditions: planted close to one another the bulbs will grow round or pear shaped, further apart they will grow flat! In Italy we call it pastinaca. The fact that the parsnip is a member of the carrot family comes as no surprise – it looks just like one, aside from its creamy white colour. It has an earthy but sweet flavour and is great used in hearty winter roasts, soups and stews. Rich in Vitamin E, Niacin, Folic acid, Calcium, Potassium and Zinc, parnsips are in season between November and April making them the ideal winter vegetable. This European root of the dandelion family is also known as the oyster plant because of the ‘oystery’ taste it gains with cooking. 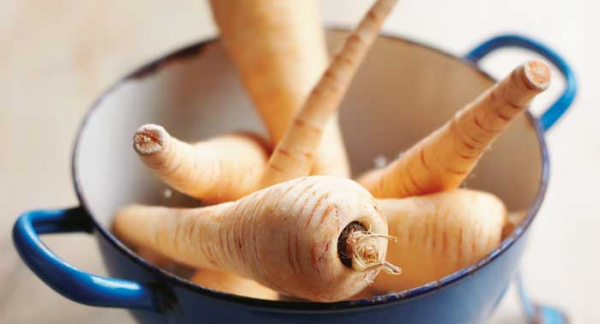 The root is similar in appearance to a long, thin tapered parsnip, with creamy white flesh and a thick brown skin. In season between August and May. Tip: the milky juice released when peeling fresh salsify tends to stain, so better to handle with gloves! 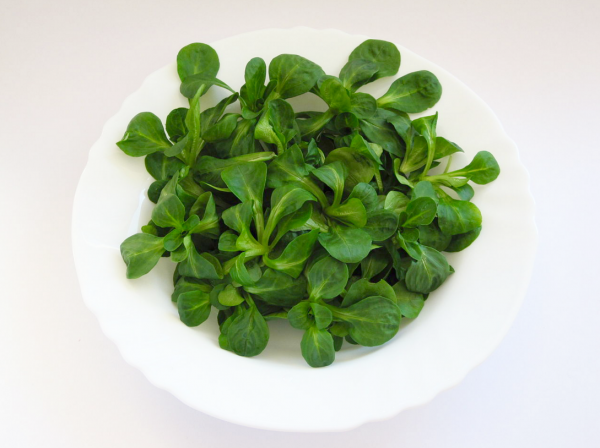 The bunched leaves of this particular plant have a characteristic nutty flavor, dark green color, and soft texture, popularly eaten as salad. Not related to chickory, lamb’s lettuce (also known as corn salad, mâche or rapunzel) valerianella, as we call it in Italy, grows in cold weather so you can find it in season in Italy between August and March. There are more than 20,000 varieties of apples worldwide and – consequently – boundless range of flavors and textures. They are rich in pectin, a fiber with digestive properties that can also lower cholesterol. Apple season runs from January to December as different varieties ripen at different times of year. The small window between November and February is the time to get your fill of this fabulous citrus fruit. Clementines are a sweetest variety of Tangerines whose juicy segments are flavorful and tangy, contain no seeds and are recognizable by loose, baggy bright orange skin and deep green leaves still attached to the stem. Clementine segments can be eaten on their own or dipped in melted chocolate. The zest can be candied or used to make “mandarinetto” liqueur, a close relative of limoncello. Dried dates are sweet, with a rich, deep flavor and a lush, slightly chewy texture. The caramel brown Medjool variety is the sweetest, and tastes somewhat like toffee. Dates are one of the oldest cultivated fruits: it’s thought that they were a staple part of the Babylonian diet 8,000 years ago. During the Christmas holidays (which in Italy last through January 6th with the Befana) Italians indulge in dried fruits and nuts, and dates – either stuffed with almonds, plain, or smeared with salted butter – are a big part of that sweet meal ending. Dried dates are available the whole year round, but the fresh type are at their best now. Available year round but at their peak between January and March, lemons are one of the most versatile fruits around. The best lemons for juicing or using for wedges are those with a smooth, thin skin, while the best for zesting are those with thicker, knobbly skin, which tend to be larger. Always buy unwaxed lemons (shops should state this clearly), especially if you’ll be using them for zesting. If you can’t find unwaxed produce, scrub the lemons thoroughly with baking soda before zesting. Lemons contain exciting levels of Vitamin C. Tip: to extract the maximum amount of juice, make sure lemons are at room temperature, and roll them between your hands or on your kitchen counter. In season from November but at their peak in now, oranges originate in China where they were first cultivated around 2500 B.C. Oranges were introduced in Europe, and specifically Italy, by the crusaders in the XI century, grown widely in Sicily for medicinal purposes. Sweet oranges on the other hand remained unknown until the late XV century or the beginnings of the XVI century, when Italian and Portuguese merchants brought sweet orange trees into the Mediterranean. 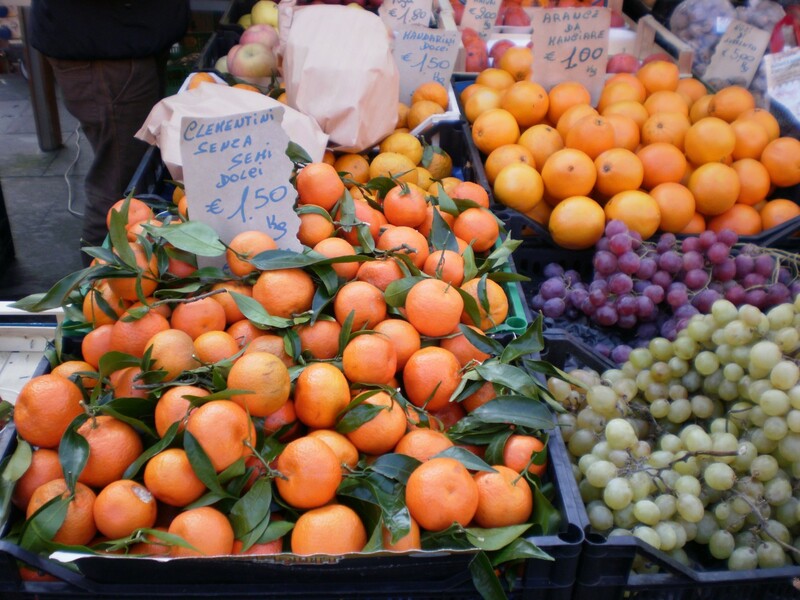 In Naples, the dialectal term for oranges is Purtuallo, a shift of the word “Portogallo, for Portugal. In Greece the juice is called Portocalada, from the same roots. Pears boast sweet, granular flesh which is delicate and that bruises easily when ripe. In season from August through to April, according to variety. Tip: Always buy them slightly underripe (they should be firm but not hard). Did you know pears ripen from the inside out? Fresh chestnuts are around from the end of September to the end of January, but given the warm winter we’ve been having in Italy, Caldarroste (open fire-roasted chestnuts) are still being sold on the street, releasing their unique comforting and wintery aroma. The sweet, crumbly nut also provides Italians (and Tuscans, in particular) with chestnut flour which is employed in interesting desserts like castagnaccio (a gluten-free non-sweet dessert, added with raisins, pine nuts and rosemary needles) and necci, delightful chestnut flour pancakes. In contrast to other nuts, chestnuts are low in oil and a high water content (hence their unique, soft texture) and should never be eaten raw. 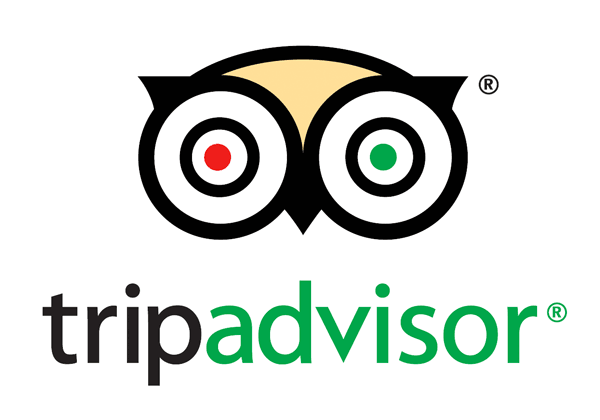 An old Italian wives tale maintains eating raw chestnuts will give you head lice! 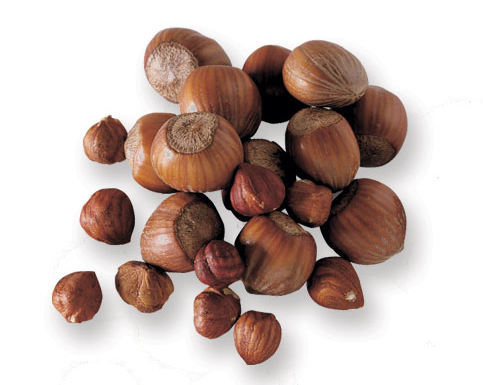 Available in Italy all year round but picked in late Fall and enjoyed all winter long, hazelnuts are encased in a smooth, hard brown shell. The sweet-tasting, cream-colored kernel is small and round, with a pointed tip and thin, dark brown skin which is faintly bitter. Hazelnuts are good eaten raw (or engulfed in chocolte bars) but the flavor takes on a more mellow, sweet character when roasted. Walnuts are among the most popular and versatile of the nuts. When picked young, they’re known as wet and their milky white kernels are mainly used for pickling. Far more common are dried walnuts, either shelled or unshelled. The brown-husked meats have a bumpy, ridged surface. Slightly bitter in flavor, walnuts are good eaten raw or cooked, in either sweet or savory dishes, and are particularly useful for baking. Dried unshelled walnuts are available in our winter months, from December to February. What fruits and vegetables are in season in February where you live? parsnips sadly are very hard to find in Italy and indeed most Italians don’t know what it is . Pastinaca in Neapolitan means carrot.